We put the C & L in Clean! Serving the Northern Ohio and surrounding areas of Lorain, Erie, and Sandusky Counties. When I came in to the station this morning I couldn't believe the difference. You do a great job! You worked a miracle on the gum or glue spot in front of the WOBL studio door. I meant to have Lorie ask you to see what you could do with that specifically & I forgot. But of course you took care of it anyway. We create a space that is healthier for you, your family, and pets by using safe and natural cleaning products. Put our cleaning experience to work to help remove tough soils & stains. 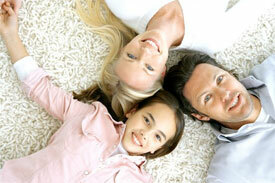 We'll leave your carpets fresh, clean, and almost dry, ready for normal use in just a few hours. We use green sealed approved and environmentally friendly products. To discuss your carpet cleaning needs with one of our experienced Ohio carpet cleaning technicians, contact us today at (440) 963-2020.